With over 20 years of service expertise between our 2 full-time license technicians, and all the diagnostic equipment necessary for VW/Audi/Porsche, you can be certain that any concerns will be handled in a professional and timely manner. 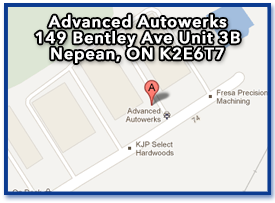 Call 613-727-1432 or email service@advancedautowerks.ca for a service appointment. • Vag-com diagnostics & coding. • Top of the line tools to allow us to repair the most complex problems. • Committed to the repair of your vehicle the right way and the first time.